Twitter Inc. (NYSE:TWTR) has been reportedly suspending an enormous number of suspicious accounts per day to counter the spread of misinformation. This could further lead to hitting its already-stalled users’ growth, the media reported. The Washington Post has compiled the data which indicate that Twitter has suspended as many as 1 million accounts a day in recent months. Total 70 million Twitter accounts have been suspended in the month of May and June 2018, and the pace has continued in July month too. As a matter of fact, Twitter’s letter to shareholder in Q1 2018 has mentioned that “ongoing information quality efforts” had negatively impacted monthly users. Therefore, if the process of sweeping out the Twitter users continues to take place, it could lead to impact user numbers in the future as well. According to a recent study, nearly 90% of active Twitter users spread false information, especially during public emergencies or disasters. This leads to increase the fake news on the micro-blogging site much faster than the truth. In a blog published by Twitter revealed that the company has introduced new measures to fight abuse and trolls, new policies on hateful conduct and violent extremism, and are bringing in revised technology to curb spam and abuse. 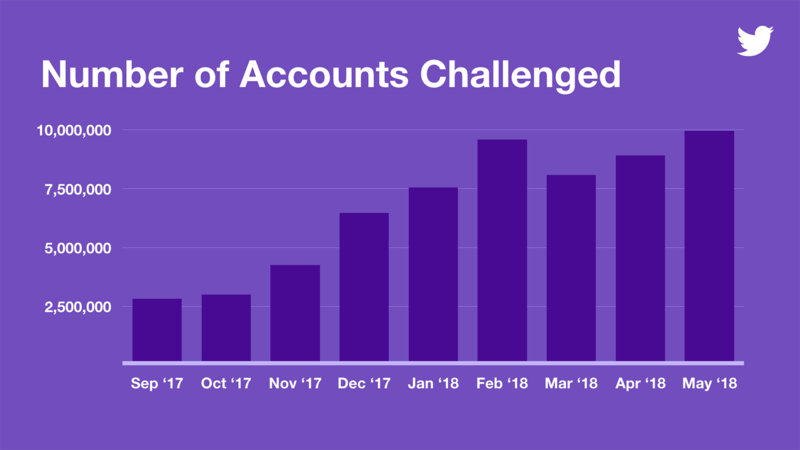 In May 2018, the technical system of Twitter went on to identify and challenge a whopping more than 9.9 million potentially spammy or automated accounts per week. The number has only been rising in the recent months. In December last year, it reached 6.4 million from a staggering 3.2 million in September. Commenting on the stern stand taken by Twitter, Wedbush analyst Michael Pachter said that it’s hard to believe that out of 336 million monthly active users of Twitter, 70 million accounts were affected and removed in just two months. As of May 2018, Twitter’s automated systems were identifying and “challenging” about 10 million spam accounts per month, a Twitter spokesperson informed Gizmodo. The process which occured as a consequence of not adding a phone number to an account flagged as “suspicious.” Twitter also went on to reveal that it has been blocking the creation of 50,000 suspected spam accounts per day. Keeping the company’s user growth at sake, Twitter is growing campaign against bots and trolls. The steps being taken is believed to be a part of the ongoing fallout from Russia’s disinformation offensive which took place during the 2016 presidential campaign. The predicament when a St. Petersburg-based troll factory was able to use some of America’s most prominent technology platforms to massively to deceive its voters in order to exacerbate social and political tensions. “One of the biggest shifts is in how we think about balancing free expression versus the potential for free expression to chill someone else’s speech. Free expression doesn’t really mean much if people don’t feel safe”, says Del Harvey, Vice President for Trust & Safety – Twitter . There is a probable circumstance that the substantial fall in the users could lead Twitter to lose its customers. However, the probable chance of it having potential long-term benefits cannot be ruled out. Cutting down on the malicious data and spammers would actually generate a pleasurable experience in the quality of users experience. Despite the effectiveness of banishing the spammers, crypto twitter has significantly become the less enjoyable place to spend time.